There are so many diet theories that people already know. But sometimes it is not any type of diet or a good fit applied to ourselves. Some diets that we often hear or we met who had a boom is OCD and diet mayo. OCD itself is a diet with meal time applying window that will gradually adjust to our ability as a dieter. OCD is applying a window dining with a choice of eating free, diet mayo restrict our food intake. That note is no salt no sugar no fry and no worried, right? 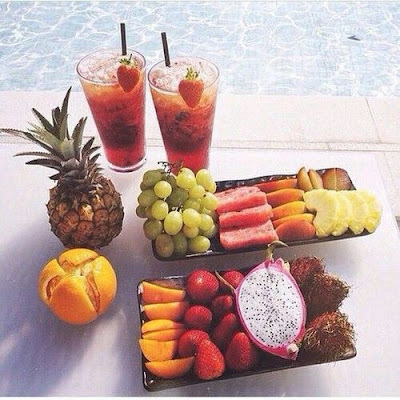 Fruits are important in the diet. Fruits became mandatory after the breakfast menu could drink warm lemon water after waking up. By getting drinking warm lemon water and fruit in the morning, you can start your day fresher. Vegetables are a must eat when dieting especially low-salt diet. Cooking vegetables for food when low-salt diet is easy. Examples of foods that are easily cooked is sauteed kale. The material is quite easy as kale, garlic, pepper, slices of chilli, and himalayan salt or very little salt. Sauteed it in the anti scratch pan so sauteed kale could be your lunch menu. To enhance carbohydrate content of your food intake, you can add four tablespoons oatmeals as a substitute for rice. Usually when you're on a diet, some people avoid milk. But you should not hesitate to drink milk anymore, because you can drink skim milk. Skim milk are often found in supermarkets in the ready to drink. But I'd recommend skim milk in powder form because it can be stored for a long time. Some people say that diet depends on what you eat or what you though in the kitchen. But I think success or failure of a low-salt diet is also dependent on the intensity of what you spend. So the key is how much input and output. Exercise can be done in a way that is simple, such as roads around the complex or clean the house because the most important thing is to move do not be silent. Set aside a day where the day you are free to do anything and take anything but with good control. For example, set aside Sundays to not exercise and eat food that should not be eaten on the day such as noodles. I usually eat noodles with some notes such as buying noodles from producers that are concerned about health. For example consume noodles that less fat so when to eat it, we do not have to worry about food would affect the success of a low-salt diet.